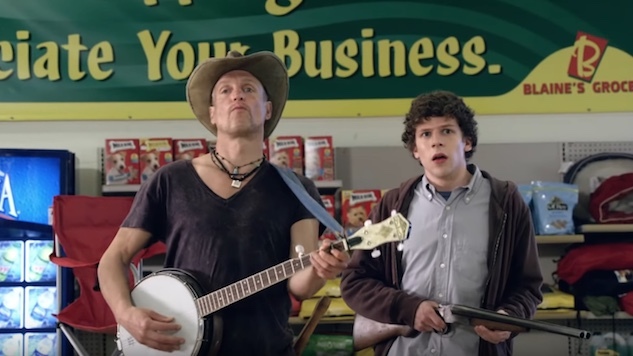 There’s finally some movement on the long-nascent sequel to 2009’s zombie-comedy hit Zombieland. A first-look poster has been revealed along with an official title for the new film: Zombieland: Double Tap. The sequel poster came side-by-side with the original in a 10-year challenge shared via the film’s Twitter account. The four original main cast members, Jesse Eisenberg, Emma Stone, Woody Harrelson and Abigail Breslin, are set to return for the sequel. Deadline also reported Tuesday that Daredevil and Luke Cage star Rosario Dawson will join the cast. Other previously announced newcomers to the franchise include Zoey Deutch and Avan Jogia. The sequel reportedly follows the zombie slayers as they encounter new zombie mutations and survivors alike, all while dealing with the growing pains of their strange little makeshift family. In addition to the return of the original cast, the script for Zombieland: Double Tap was penned by original writers Paul Wernick and Rhett Reese. Original director Ruben Fleischer will return as well, fresh off the box office success of his latest effort Venom. Gavin Polone will produce the sequel, and Reese and Wernick will serve as executive producers. Filming for Zombieland: Double Tap is set to begin this week, and it’s been slated for an Oct. 11 release by Columbia Pictures.